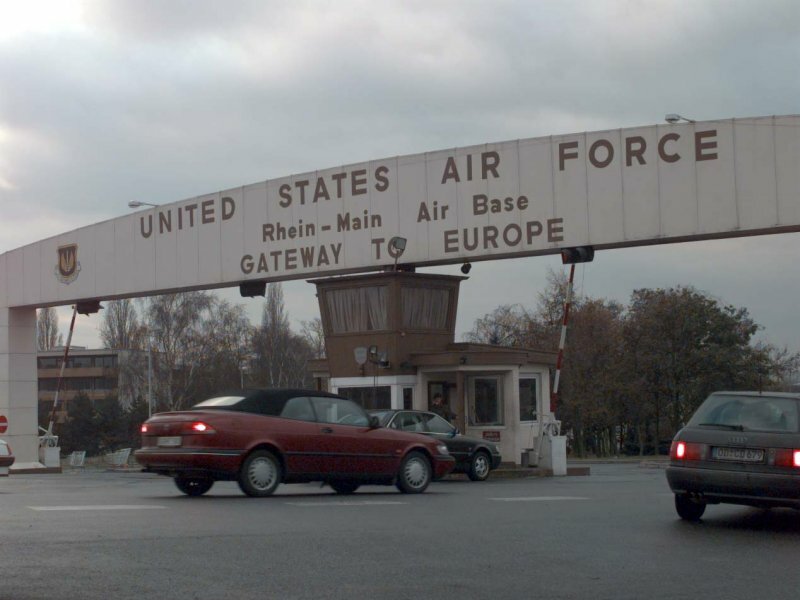 For decades the Air Force's "Gateway to Europe," Rhein-Main Air Base outside Frankfurt closes in December 2005. 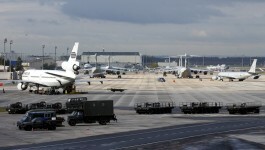 Rhein-Main Air Base is located near Frankfurt, Germany. No aircraft are permanently assigned to the base. 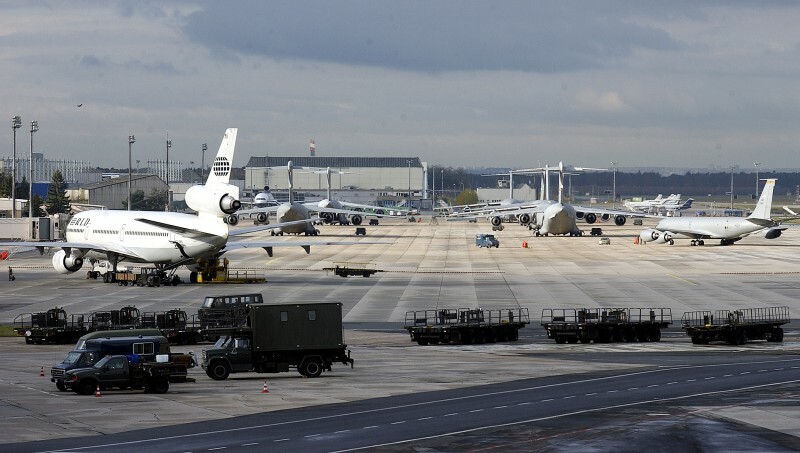 Rhein-Main Air Base is a small base named after the confluence of the Rhine and Main (pronounced mine) rivers located to the west of Frankfurt. This small community is approximately six miles southwest of Frankfurt, in the state of Hessen. The 469th Air Base Group is Rhein-Main's host unit, supporting 30 associate units and organizations and more than 3,000 military, civilian, contractor and family members. Its mission is to maintain an infrastructure ready for major airlift contingencies and to provide quality base operating support. 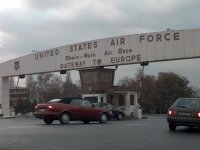 US Air Force and German authorities signed an official agreement Dec. 23, 1999, to close and return the base to Germany by Dec. 31, 2005. During that ceremony, the Luftbruecke (air bridge) Memorial was also transferred to the Frankfurt Airport Company. The memorial highlights Rhein-Main's key role in the Berlin Airlift and stands as a symbol of the base's history as a strategically located airlift facility. The city of Frankfurt has a population of over 630,000 but that number doubles during the workday when people commute from all over to work in the city. Frankfurt offers all the services expected from an international city. The city has over 1000 years of history. It is Goethe's birthplace, the seat of the first national assembly, and a center of trade from the very early days. Roman armies camped here. Charlamagne held an imperial Reichstag here. Thirty-six rulers were elected here. Frankfurt is Germany's main financial center and the headquarters of the German Federal Bank, the Bundesbank, which supervises the stability of the Deutsche mark. The city is a hub of autobahn intersections and railway junctions. The Frankfurt International Airport handles more passengers than any other European airport. In 1909, Count von Zeppelin used the area as a landing site for his lighter than air dirigible Z-II. Germany had planned the site for use as one of the most important European air terminals on the continent. In 1936, the base opened for commercial use. The northern part of the base saw use with airplanes and the extreme southern part near Zeppelinheim served as a base for rigid airships. The southern portion of Rhein-Main became the port for the Graf Zeppelin, its sister ship LZ-130, and until May 6, 1937, the ill-fated Hindenburg. The airships were dismantled and their huge hangars demolished on May 6, 1940, when the base was converted for military use. Luftwaffe engineers extended the single runway and erected hangars and other facilities for German military aircraft. During World War II, the Luftwaffe used the field sporadically as a fighter base and as an experimental station for jet aircraft. Allied forces bombed the base heavily in the latter part of 1944 and the beginning of 1945. The United States 826th Engineering Aviation Battalion arrived at Rhein-Main in April 1945 and immediately began clearing rubble and reconstructing major buildings. Army engineers built new runways and extended and widened the existing runway. Also, they constructed new aprons and hardstands as well as taxiways leading to the new Rhein-Main passenger terminal completed in 1946. Air traffic into Rhein-Main increased in October 1946 when the air terminal at Orly Field, Paris, France, closed. Rhein-Main then hosted the Eastern Air Transport Service in January 1947. Officials in Ninth Air Force intended the base for use as a bomber base, but Rhein-Main became a principal European air transport terminal from 1947 to 1959. Rhein-Main was the main western base for the round-the-clock Berlin Airlift, Operation Vittles, from June 1948 to September 1949. In April 1959, US Air Forces in Europe turned over the northern part of the base to the German government for use as a civilian airport. The Flughafen, Frankfurt Airport became the chief commercial airport for the greater Frankfurt area in April 1959. The rest of the base remained under control of USAFE. The base became the principal aerial port for US forces in Germany. On July 1, 1975, the base was assigned to Military Airlift Command. Under terms of an agreement with the Federal Republic of Germany, only transport aircraft have been stationed at Rhein-Main since May 1975. On April 1, 1992, the base was reassigned to USAFE. The base functioned as a major hub for US forces deploying and redeploying for Operation Desert Shield and Desert Storm. The base delivered increasingly larger amounts of humanitarian aid for Operation Provide Comfort, Provide Hope, Restore Hope, Support Hope and the longest sustained humanitarian airlift relief effort in history, Operation Provide Promise. On Dec. 20, 1993, base officials announced plans to draw down to half the size and reduce the active duty force by more than two-thirds. Rhein-Main completed its drawdown April 1, 1995. The remaining units support more than 2,600 community members, 30 tenant units and maintain contingency facilities for spin-up use by transient airlift aircraft. No aircraft are permanently assigned to the base. Frankfurt, Germany, is located at the confluence of the Rhein and Main Rivers in the state of Hessen. The city accommodates most of the country's large banks and many branches of foreign banks in Germany. It is also the headquarters of the Bundesbank, which guards the deutsch mark's stability. Frankfurt is also a transportation hub having Germany's main autobahn and railroad interchanges. The Frankfurt International Airport, which shares runways with the air base, is the largest freight and second largest passenger airport in Europe. Buses into Frankfurt can be caught just outside the gate 2-3 times per hour. The Zeil is a major shopping area in Frankfurt with German department stores as well as a Woolworths and a Disney store. Zoos, parks, museums and good restaurants provide reasonably priced entertainment for families. A large market held every Saturday morning along the Main River in Frankfurt brings sellers from all over with new and used goods. Similar market can be found in almost all German communities, both large and small, and usually on Saturdays. These are worth going to just to experience, if not to buy something. Less than an hour away, in any direction, you can see wine country, castles, and all sorts of festivals. A train can be caught from Frankfurt to just about anywhere in Europe and reasonably priced tours are frequently available to places like Poland, Amsterdam, the Czech Republic, and cities including Cologne, Florence, and Paris. A one day excursion can take you to the oldest city in Germany (Trier - 2000 BC), a picnic along the Main River, a Rhein River cruise, or an amusement park like Phantasialand. An hour or two north of Frankfurt is the Fairy Tale Drive where the Grimms Brothers based their stories of Red Riding Hood and Sleeping Beauty. Berlin is about 350 miles to the northwest and Switzerland is about the same distance to the south. Germany is situated is the temperate zone between the Atlantic Ocean and the eastern part of the European continent. There are constant alternations between warm subtropical air masses and cold air from the Arctic, between high and low pressure systems. Major changes in temperature are rare. Winters are usually mild or at most cool, with an average temperature of 1.5 degrees Celsius in the lowlands and minus 6 degrees Celsius in the mountains. Summer weather is often changeable with a great amount of precipitation. Average July temperatures range around 18 C in the northern lowland plains and 20 C in the sheltered valleys of the south. Winters can be very cold or very mild, just as summers may be very hot and dry or rainy and cold. Some summer days can be colder than a mild winter afternoon. Whatever the case, there is precipitation all year round.